Pioneer DJ announces its new rekordbox™ DJ music management app for the extremely popular Apple iPhone® and iPod® Touch, along with Android devices. The rekordbox app enables users to prepare and manage music stored on their portable devices as well as the ability to create playlists, cue/loop point and beat location settings, waveform analysis and more. 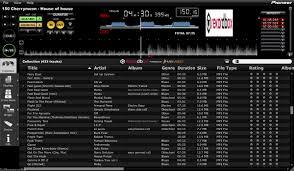 The organized music in the device can also be wirelessly synced with a computer utilizing the Pioneer rekordbox music management PC software, providing additional convenience of preparing music for playback on a Pioneer DJ system. Pioneer's recently announced XDJ-AERO DJ system takes full advantage of the rekordbox app, enabling the iPhone, iPod touch or Android device to become an additional source for music content. The XDJ-AERO also creates its own access point, eliminating the need for hard-wired connections and allowing an smart device with the rekordbox app to send content wirelessly to the DJ system. rekordbox™ is the best way of preparing and managing your tracks, be it at home, in the studio, or even on the plane! It allows you to import music from other music management software using the Bridge function or by simply adding them into the software for management. rekordbox™ will work out the BPM and allow you to set hot cue and loop points into the track, utilizing a full beat grid view in advance, as well as color coding your music and adding all the ID3 information so it appears automatically later on any CDJ-2000/CDJ-900/CDJ-850/CDJ-350. Working with rekordbox™ also means that when tracks are exported to a USB key or SD card, the CDJ-2000/CDJ-900/CDJ-850/CDJ-350 will load the waveforms instantly. The database layout within the software can be customized to suit individual DJ style which enables personalized layouts when browsing on your CDJ-2000/CDJ-900/CDJ-850/CDJ-350s. The software's unique reverse functionality enables the new CDJs to record your cue, loop, and set history during your set which can be recalled in rekordbox™ later. If you enable the Quantize feature within the CDJ-2000 / CDJ-900, then rekordbox™ makes loop and cue points snap to the beat (1ms accurate), ensuring beat-perfect loops and cues. More than being the central music preparation software for the CDJ-2000/CDJ-900/CDJ-850/CDJ-350, rekordbox™ will also be fully compatible with future Pioneer DJ products across the range. As clubs begin to upgrade to the CDJ-900 and CDJ-2000 from the CDJ-1000MK3, the ability to travel and arrive at the club with your music prepared on a single USB or SD card (such as a USB flash memory key) is now a reality.